Quick pic of Emma (Goodreau Secret),...in some new dolly stuff!!! Emma is wearing Safrindoll acrylic eyes in "Royalty" and Jpop Reiya wig in "Pearl", top by Jakks Pacific Elle (no longer made) and a F2BM "Silver Pocket Skirt" (I cut the tag off because they bug me). Re: Quick pic of Emma (Goodreau Secret),...in some new dolly stuff!!! Oh, she looks so pretty!!!! Such a lovely girl!!!!! Your Emma looks beautiful! Those pictures really make me want a new wig for Kate, my Secret vinyl. FroggyB wrote: Those pictures really make me want a new wig for Kate, my Secret vinyl. LOL!! I have a wig fettish for my girls...anytime Jpop has a sale I find myself buying them...Ack! Can't help myself! That's why I'm always broke! I, too, have a thing for Grace's wigs. We wound up getting a ton of them two years ago when Grace offered her grab bags and heavy discounts on her mohair wigs. I still find myself purchasing when she has a sale. I don't think there has been a wig yet that we haven't loved. She has the grab bags usually twice a year so they are a great way to stock up. I just wish she would have more in stock, but I know she has more important things to think about right now. gracie wrote: but I know she has more important things to think about right now. It breaks my heart what she's going thru, I'm keeping her in my prayers and prayer for the miracle! Emma looks great in this outfit, Christina! I also love the wig in your avatar! Connie - Sweet Creations wrote: I also love the wig in your avatar! Thanks Connie! That wig is also a Reiya wig!! I got that one in a grabbag and fell in love with the style and then Jpop had a sale last week on their Reiya wigs and I couldn't resist buying the Pearl AND a Chocolate brown one!!! 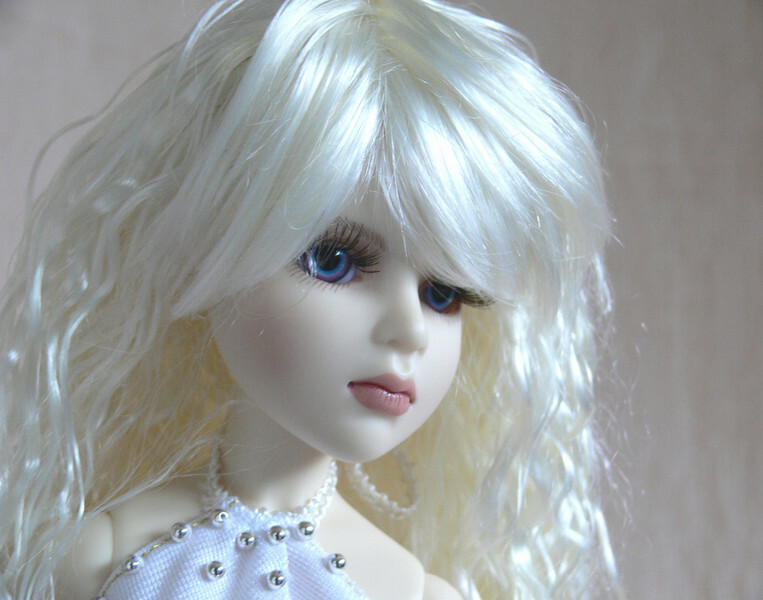 I am also a wig collector--I love to be able to change looks for my dolls. Your Secret is awesome. I think all of Paulette's girls have a unique beauty. I have Secret, Privera, Inuendo, and am waiting for Whisper. My all time favorite is Rumor as you can see in my Avator. She looks amazing--love those eyes! And that wig is divine!! I like the combination of all the pale colors. I love the wig! She looks casual yet elegant. Emma is such a beauty! Well, you know I'm biased because I have that same doll and now the same wig! Lori in OR wrote: Emma is such a beauty! Well, you know I'm biased because I have that same doll and now the same wig! Don't ya think the Reiya wig is wonderful??!! I have 3 of them, the Winter Moon, Dark Chocolate and this one...I should'a gotten the Honey Ash too...next good sale I will!! At the next good sale, I may have to get one of the Reiya wig in every color! Your Secret is so gorgeaus, Christina! Fabulous pics and styling too. Would love to see pics of your Rumor as well. I have her on her way to me and just can't wait! lol!